Contributions to Mercy, part 5. 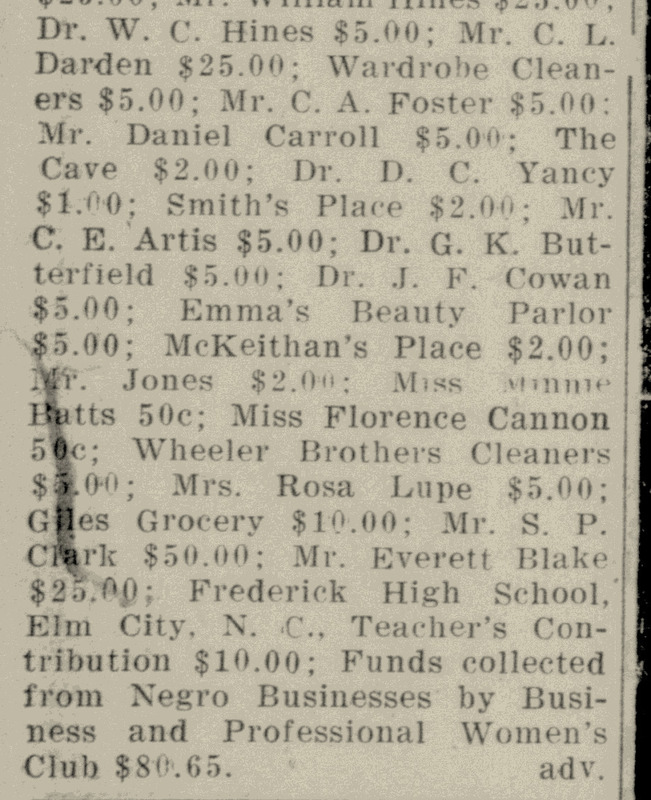 On 30 January 1947, the Wilson Daily Times published a lengthy list of contributors to the fundraising drive of the Mercy Hospital Women’s Auxiliary. The list, reproduced here in five parts, included many of black Wilson’s leading individuals, businesses and institutions. Wilson Daily Times, 30 January 1947. All annotations, some edited for clarity, are entries in Hill’s Wilson City Directory 1947-48. Contributions to Mercy, part 4. Mrs. F. McLean — probably Flowers McLean, see below. The small photograph, labeled C.J. Darden, actually depicts Camillus L. Darden. Crockett & Aiken — “Moving Houses a Specialty. Barnes Street adjoining Norfolk Southern Station.” Livery stable owner John H. Aiken died in July 1914. In the 1920 census of Wilson, Wilson County: at 123 Pender Street, widow Gergia Akin, 45, livery stable manager; her brother Alexander Crockett, 47, stable salesman; and two laborers, John Norfleet, 30, and Mose Parker, 32. Sanborn insurance map, Wilson, N.C, 1913. City Bakery — “540 East Nash St., under Odd Fellows Hall. First class and sanitary in ever particular.” R.B. Bullock. Down Town Pressing Club — L.B. Barefoot. Dennis Brooks Livery Stables — “Rear Odd Fellow Hall Nash Street.” Georgia-born Dennis Brooks also operated a grocery and a bar. The Globe Theatre — “Odd Fellows Hall Nash St. Only place of amusement of its kind in the county — Colored People.” The Globe was a Samuel H. Vick enterprise. Lincoln Benefit Society — “Chartered by the Legislature of North Carolina as a Fraternal Society. Has councils in the principal towns and cities of the state. Safe, reliable, economical.” Officers included Dr. F.S. Hargrave, president, and S.H. Vick, secretary. Ideal Pharmacy — “Any physician’s prescription will be filled at Ideal Pharmacy exactly as it would be by the best drug stores of the country. We guarantee the quality of drugs, accuracy of compounders, reasonableness of charges, and unexcelled service. Give us a trial.” Darcey C. Yancey opened this pharmacy as early as 1908. Dr. W.A. Mitchenor — “Special attention given to the diseases of women and children. … Rear of Ideal Pharmacy.” Dr. William A. Mitchner, a Johnston County native, practiced medicine in Wilson until his death in 1941. Sanitary Shaving Parlor — “The cleanest and most up-to-date in the town. We keep sharp tools, clean towels and pure toilets. Hot towels with every shave if desired. Good barbers always on hand. Satisfaction guaranteed.” Charles S. Thomas (1877-1937) was a native of Bennettsville, South Carolina. R.T. Alston — “Watches, clocks, jewelry, eye glasses, spectacles, etc. I handle the very best grade of watches, such as the Elgin, Waltham, Illinois, Hampden, and Hamilton. Your credit is good. Yes, I will sell you a watch on the weekly payment plan: that is, ‘So much down and so much each week.’ I do a mail order business also. If you want a watch or other jewelry, write me for terms and order blanks. No in a few days I shall have a large stock of watches, clocks, etc. on hand. Call to see me or write.” Robert T. Alston was a native of Granville County, North Carolina.